For Christmas, Erin gave me Half-Light, Frank Bidart’s 737-page collected poems that won the 2018 Pulitzer Prize for Poetry, and I tore through it in a surprisingly short amount of time, loving especially his long poem about Nijinsky (the dancer who choreographed Stravinsky’s Rite of Spring). Those were from the 2018 shortlist. 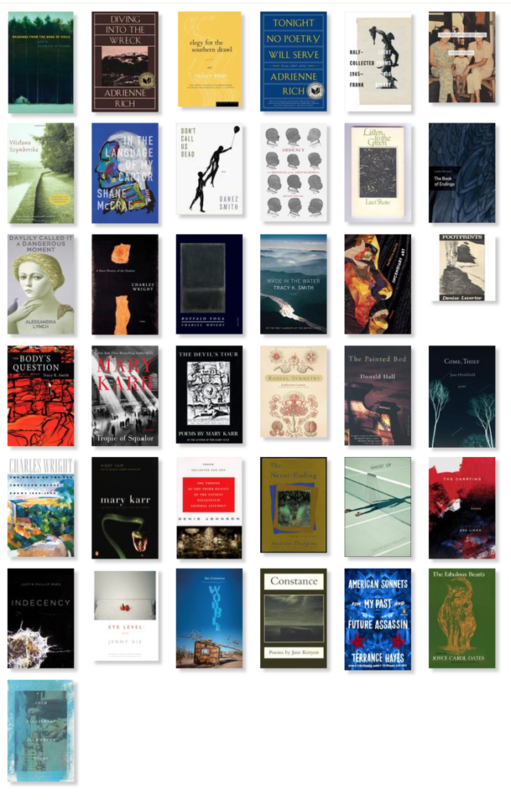 I started out the year with selections from the 2017 shortlist, including Leslie Harrison’s The Book of Endings, Shane McCrae’s In the Language of My Captors (I heard him give a reading in Grand Rapids where he mentioned how much he loves the stark compositions of Galina Ustvolskaya, and I’ve returned often to them since, an absolutely appropriate soundtrack for 2018), and Danez Smith’s Don’t Call Us Dead (hearing his performance—there’s not a better word—of several of these poem in a classroom at Vanderbilt in the Fall of 2018 made me love them even more). The year ended with a preoccupation with Jane Hirshfield’s poetry, particularly “Autumn Quince.” I first came to her work via “Lake and Maple,” which I think I discovered in a collection, perhaps one by Roger Housden — “I want to give myself / utterly / as this maple / that burned and burned / for three days without stinting / and then in two more / dropped off every leaf.” In the years since then, I’ve bought her books whenever I’ve found them at used bookstores and one, her newest, after she gave a reading at Vanderbilt. Of Gravity & Angels, published in ’88, was the first one I found, and as soon as I read “Autumn Quince” I knew I wanted to someday set it to music. And I finally had the chance. I was asked to write a piece for the Winter concert of the ALIAS Chamber Ensemble here in Nashville, along with a number of other Nashville composers. I settled on what I thought would be the richly warm instrumentation of French horn, English horn, and Clarinet, alongside a string quartet, with the text sung by countertenor Patrick Dailey. The piece is finished now, we have our first rehearsal later this week, and the concert will be on Sunday, the 24th of February, at the Blair School of Music’s Ingram Hall. Tickets are available here: http://www.aliasmusic.org/novelnoise/. This entry was posted in Uncategorized and tagged composing, composition, Jane Hirshfield, new music, poetry. Bookmark the permalink.